Optional ground sockets Available in sets of 16, 32, 48. The industry standard for easy set-up and take down. Comes in (3) attractive colors. 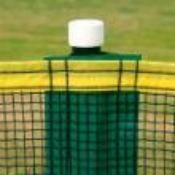 Softball / Baseball Fencing: Enduro outfield fencing has revolutionized portable flexible fencing systems. Simply slide the poles through the permanent vinyl pockets in the mesh fencing and drive the pole into the turf with a rubber mallet. You're done! no ropes... ties... clips... hooks etc. The vinyl pockets, spaced every 10 ft., create an attachment to the pole that is uniform top to bottom for excellent durability and appearance. Steel pilot hole tools is included for hard ground. OPTIONAL ground sockets available in sets of 16, 32 or 48.